​Dance Year is now open. Ballet dance is a formal & beautiful style of dance with its origins in the Italian Renaissance and further developed in France and Russia as a concert dance form. It is a highly technical form of dance with a universal vocabulary. It is best known for its classical form and notable for its graceful, flowing, precise movements. Ballet serves as the backbone for many other styles of dance, as many other dance genres are based on ballet. Ballet became popular to the mainstream society with famous productions from Russian composer Tchaikovesky’s Swan Lake, & The Nutcracker that have inspired the dance form to be appreciated by the public. Jazz is a fun dance style that relies heavily on originality and improvisation. It originated in the U.S. in the early 1900s as African and European styles merged. A jazz dancer was traditionally part of a jazz band during performances. These dance trends soon spread & the result came in the form of popular dances such as the Charleston, Jitterbug, Swing & Boogie Woogie. Jazz dance gained more mainstream success is musical theatre productions such as West Side Story & Chicago, popularized by choreographer Bob Fosse. Many jazz dancers incorporate rhythm, coordination & fast paced movements with different styles into their dancing, allowing their own expression. Jazz has several benefits including strength, flexibility, and endurance training with high leaps, floorwork, & nimble precise steps. Jazz dancing often uses bold, dramatic body movements, including body isolations and contractions. Tap dance was developed in the United States during the 1900s, and has become popular world-wide. This style is a fusion of British Isles clog dancing & step dance with African drumming. Legends Fred Astaire and Gene Kelly maintained the dance styles popularity through their own interpretation that are still used today. Mainstream popularity of Tap dancing came about through dancers performing with Jazz bands in lounges as well as the musical theatre production 42nd Street. The name comes from the tapping sound made by the specific shoe of the dancer designed with metal plate affixed to the ball and heel of the sole. When the small metal plates on the dancer's shoes touch a hard floor the sound is expressed and the dancer can move with the rhythm of the sound. This lively, rhythmic tapping makes the performer not just a dancer, but also a percussive musician! Lyrical dance is a fusion of ballet and jazz dance techniques. This style challenges choreographers and dancers alike to use motion to interpret music and express emotion. With a relatively recent history focusing on musicality a lyrical performance can include but is not limited to a fusion of ballet with folk, rock, pop, and alternative music. A lyrical dancer's movements attempt to convey the meaning of the music. Lyrical dance is a very passionate and emotional dance style. Another aspect of this style focuses on each dancers individual approach rather than precise movements and is often the style chosen by soloists. Lyrical dance portrays certain emotions and tells a story through every movement made. Hip-Hop is a dance style made popular in the 1970s in the US by “dance crews” and DJS, usually danced to hip-hop music that evolved from the hip-hop culture. The style was popularized in the South Bronx, New York, where originally the DJS were legendary and famous which then inspired dancers by mixing songs on turntables to entertain. Hip-hop includes various moves such as breaking, popping (which bore the famous dance Electric Boogalo), locking and crumping, and even house dance. Improvisation and personal interpretation are essential to hip-hop dancing. The style maintains popularity today in mainstream culture through R&B, Hip Hop, and Rap music with popular dances like the Cupid Shuffle, Watch me Nay Nay, the Dougie, Electric Shuffle, the Wobble & more! Clogging is a type of folk dance in which the dancer's footwear is used percussively by striking the heel, the toe, or both against a floor or each other to create audible rhythms, usually to the downbeat with the heel keeping the rhythm. Possibly one of the oldest forms of dance with origins dating back to the 1400s, this style has been embraced in Europe & the US through competitive dance as well as popularized by Celtic step dancing from the United Kingdom. Classes begin in September and continue until our annual dance recital in May. Tuition is due the first lesson of every month. Tuition paid after the 10th of the month will be assessed a $5.00 late fee each week until the tuition is paid. ​There is a $25 return check fee assessed for returned checks. ​Checks for tuition should be made payable to Grayson School of Dance.​ Payments can also be made online via your monthly tuition invoice. Our annual recital is held in May every year. For more information regarding our Annual Recital, please click the button below. Recital costumes fee's are due in November. For more information regarding costume fee's, please click the button below. Costume's shown above are from the 2018 Recital. Your child will receive a costume for each class they are registered for. We measure each student for the best possible fit, according to each company's sizing chart. The price per costume is $54.00. All students receive an invoice in October & November for costume fee's. Your costume fee's are broken down according to the schedule above. Costume fee's must be paid in full by December 1. ​Your child will receive their costumes during class usually during the months of February and March. $90.00 for the 1st student in the family, $40 for the second student and $20 for each additional family student. Fee will increase $15 each if paid after March 15, 2019. Recital fee's are due February 1, 2019. All students must come to class dressed in appropriate dance attire relevant to the class they are attending. Shorts, t-shirts, and jeans of any kind are not allowed. Hair must be worn away from face at all times, preferably in a ponytail or bun. Dance Shoes must be worn during class. Students with out proper shoes may not be permitted to dance. Without proper shoes injury may occur. Pointe shoes are required when you take a pointe class. Failure to wear your pointe shoes during class will result in this privilege being taken away and you will be transferred to a regular ballet class. We expect each student to come to class with a positive attitude and respect for their classmates and teachers. Students who are disrespectful to teachers, other students, or cause a disruption to the class will be asked to leave the room. A meeting with the parent and teacher will be scheduled. Should there be a re-occurrence of this behavior, the student will be expelled from his/her dance class. We understand that there are times when students need to miss dance class. However, in fairness to your child, their classmates, and the teacher we ask that your child attend as many classes as possible. Please call the studio at (863) 646-9255 if your child is going to miss class more than one consecutive week. Please enter the west side of the building. If you are planning to stay, please park in the rear of the building. 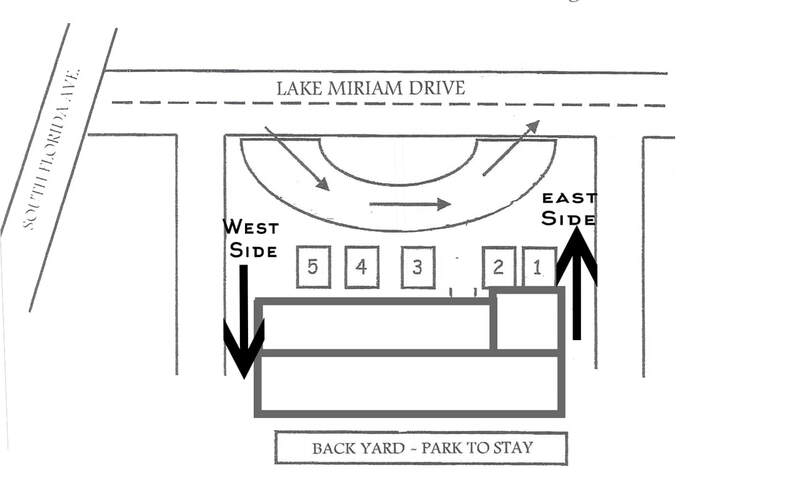 If you are dropping your child off, please enter on the west side and use the semi circle in front. When leaving from the back lot, please exit the east side of the building. There are only five designated parking spaces in the front parking lot and we ask that you DO NOT park behind spaces already occupied. Please do not block the entrance or exit side of the building.